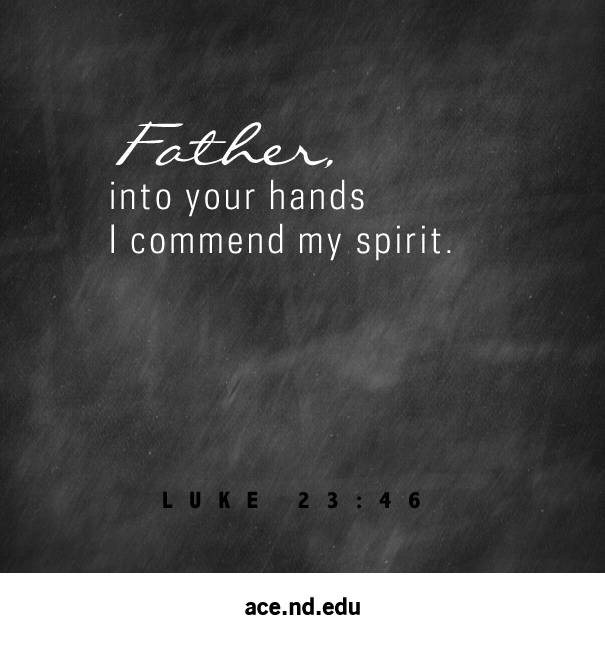 On Sunday we looked at this saying of Jesus on the cross: “Father into your hands I commend my Spirit”. When we take Jesus’ words in light of the rest of the verse we see that Jesus’ prayer is both a prayer of trust, and rescue. The second thing we noticed was that while the translation of the word, “spirit” is correct in English, it is lacking. When we hear “spirit” we think of soul or the opposite of “body” or the material world. But the word in both Greek and Hebrew has earthy roots. Jesus here is not praying to hand over his “soul” but his entire being. This is why Eugene Peterson’ in his translation, translates this verse as, “I’ve put my life in your hands”. And this gets at the heart of what is happening. Jesus is trusting the Father, not just with his soul, but his entire life. And what is so remarkable about this, is that Jesus at the end of his life turns to faith. We sometimes cheapen this moment by thinking, “Well Jesus…was Jesus he knew he would be resurrected”. But we are saying that on this side of history. Jesus hasn’t lived it yet, and so while he has faith the Father will rescue him, it simply put hasn’t happened yet. So Jesus is starting into death, darkness, and the weight of sin knowing he is about to be abandoned but in his last moments he doesn’t give up on faith, he gives in to faith. He says “Father I trust you even now”, you are all I can hold onto. What is beautiful is that because Jesus prayed this prayer so can we. We will never know what Jesus experienced, nor will we ever go through the depth of what he experienced. But because of Jesus, even when we are at our worst, in our deepest struggle, because his spirit lives and moves within us – we can pray this prayer like him. When we come up against darkness that doesn’t quit, death that steals our life, we can choose to trust in God. To say, “Father I trust you with my life” which is where we ended on Sunday. Big Idea: That if Jesus prayed this prayer, so can we. There is cosmic significance to what is happening. Jesus’ prayer is both a prayer of trust, and rescue. That if Jesus prayed this prayer, so can we. What stuck out to you from the sermon? What was challenging to you? How did God speak to you through it? What was new? Have you practiced Lent before? What can you fast or give up this year? Is there any difficulty you are facing right now? What is it? Can you name it? Can you trust God in the midst of it? What might that look like? Can you pray the prayer Jesus prayed? Read the story today with your kids. Talk to them about how Jesus, in the most difficult moment, trusted in his Father. Remind them they can always trust in God. Previous Where Are You God?